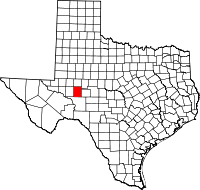 Reagan County is a county on the Edwards Plateau in the U.S. state of Texas. As of the 2010 census, its population was 3,367. The county seat is Big Lake. The county is named after John Henninger Reagan (1818-1905), who was the postmaster general of the Confederate States and also a U.S. Senator, U.S. Representative, and first chairman of the Railroad Commission of Texas. First inhabitants Paleo-Indian, Suma-Jumano, Kiowa and Comanche. 1858–1861 Butterfield Overland Mail crosses the center of the county. 1878 Camp Grierson's Spring is established as a subpost of Fort Concho and named in honor of Col. Benjamin H. Grierson. 1903 Reagan County is carved from Tom Green County and named for United States Senator John Henninger Reagan. Stiles, named after local rancher William G. Stiles, becomes the first county seat. 1911 The Kansas City, Mexico and Orient of Texas Railway is completed. 1923 Oil is discovered at the Big Lake Oilfield in the Permian Basin. Big Lake Oilfield, located on University of Texas System land, opens the Permian Basin to oil production and endows the Permanent University Fund. The rig is named Santa Rita #1 for The Patron Saint of the Impossible. Big Lake is incorporated as a city. 1924 Boom town community of Best plunges into vice and violence, necessitating the Texas Rangers intervention. The Rangers destroy buildings that are being used as brothels, gambling houses, and saloons. 1925 Voters move the county seat to Big Lake. 1926 Texon is established by the Big Lake Oil Company for its employees and their families and is devoted to family life. 1951 A renewed oil boom from the Spraberry Trend production. According to the U.S. Census Bureau, the county has a total area of 1,176 square miles (3,050 km2), of which 1,175 square miles (3,040 km2) are land and 0.7 square miles (1.8 km2) (0.06%) is covered by water. The Spraberry Trend, the third-largest oil field in the United States by remaining reserves, underlies much of the county. As of the census of 2000, there were 3,326 people, 1,107 households, and 872 families residing in the county. The population density was 3 inhabitants per square mile (1.2/km2). There were 1,452 housing units at an average density of 1 per square mile (0.39/km2). The racial makeup of the county was 64.64% White, 3.01% Black or African American, 0.54% Native American, 0.27% Asian, 29.56% from other races, and 1.98% from two or more races. 49.49% of the population were Hispanic or Latino of any race. There were 1,107 households out of which 46.80% had children under the age of 18 living with them, 68.10% were married couples living together, 7.20% had a female householder with no husband present, and 21.20% were non-families. 19.80% of all households were made up of individuals and 7.50% had someone living alone who was 65 years of age or older. The average household size was 2.96 and the average family size was 3.42. In the county, the population was spread out with 34.20% under the age of 18, 7.60% from 18 to 24, 28.10% from 25 to 44, 19.90% from 45 to 64, and 10.30% who were 65 years of age or older. The median age was 32 years. For every 100 females there were 100.50 males. For every 100 females age 18 and over, there were 100.50 males. The median income for a household in the county was $33,231, and the median income for a family was $36,806. Males had a median income of $31,228 versus $18,750 for females. The per capita income for the county was $13,174. About 9.30% of families and 11.80% of the population were below the poverty line, including 10.60% of those under age 18 and 23.60% of those age 65 or over. ^ Smith, Julia Cauble. "Reagan County". Handbook of Texas Online. Texas State Historical Association. Retrieved 29 November 2010. ^ "Martin-Castillo Expedition". Texas Historical Markers. William Nienke, Sam Morrow. Archived from the original on 1 March 2012. Retrieved 29 November 2010. ^ Weddle, Robert S. "Juan Domínguez de Mendoza". Handbook of Texas Online. Texas State Historical Association. Retrieved 29 November 2010. ^ "Nicolás López". Handbook of Texas Online. Texas State Historical Association. Retrieved 29 November 2010. ^ "American Journeys". Wisconsin Historical Society. Retrieved 29 November 2010. ^ Richardson, Rupert N. "The Butterfield Overland Mail". Handbook of Texas Online. Texas State Historical Association. Retrieved 29 November 2010. ^ Wilkerson, Lyn (2003). American Trails Revisited: Following in the Footsteps of the Western Pioneers. iUniverse, Inc. p. 277. ISBN 978-0-595-28262-3. ^ "Stiles, Texas". Texas Escapes. exas Escapes - Blueprints For Travel, LLC. Retrieved 29 November 2010. ^ Werner, George C. "Kansas City, Mexico and Orient of Texas Railway". Handbook of Texas Online. Texas State Historical Association. Retrieved 29 November 2010. ^ a b Olien, Roger M and Diana (2002). "Oil in Cow Country". Oil in Texas: The Gusher Age, 1895-1945. University of Texas Press. pp. 138–167. ISBN 978-0-292-76056-1. ^ "Big Lake, Texas". Texas Escapes. Texas Escapes - Blueprints For Travel, LLC. Retrieved 29 November 2010. ^ a b "Big Lake, Texas History". biglaketx.com. Archived from the original on 2011-07-07. ^ "Best, Texas". Texas Escapes. Texas Escapes - Blueprints For Travel, LLC. Retrieved 29 November 2010. ^ "Texon, Texas". Texas Escapes. Texas Escapes - Blueprints For Travel, LLC. Retrieved 29 November 2010. "Reagan County Profile" from the "Texas Association of Counties"